Watching vines grow around posts and supports is a magical experience. The vines seem to grow rampantly, and each day, they have a story to narrate. Many vines tend to bloom and bear fruits, and this adds to their beauty. Rather than letting your vines grow across your yard and take up valuable living space, you can train them to grow on trellises. A trellis is one of the best ways to raise your garden vertically and still enjoy the lush greenery. Vines can be delicate and lightweight or be heavy with vigorous growth. It is important you choose a trellis that matches the growth of the vine so that it can provide the right support. Delicate vines like sweet potato or clematis can adapt to any trellis. You can use sticks to frame a slender wooden trellis or use lightweight aluminum rods to make a support. Some gardeners also use a light mesh wire against the wall of their home to create a simple trellis to lift the vines off the ground. There are so many options when it comes to lightweight vines that do not require strong support. This option changes for vigorous vines like bougainvillea and wisteria. Wisteria has the tendency to break wooden trellises at joints as it is growing while bougainvillea is a heavy vine and can make a lightweight trellis sag and droop. So if you have large vines, it is best to go in for strong and stable wooden posts to form a frame using high-quality hardware. If you are worried about the strength of the trellis, metal frames could be perfect for vines that have vigorous growth. It is important to remember that you cannot paint wooden trellis if your vines are growing on it. You would need to cut the vines to reach the frame or remove it from the trellis until you finish the painting or applying wood preservative. After the coat dries, you can reattach the vines. This can be cumbersome and time-consuming. So if you don’t want to spend too much time on maintaining the trellis, choose a material that does not require too much upkeep or painting. Remember that you will be sharing your vertical garden with other guests. Local birds will want to get to the bounty growing on the vines. They will leave behind evidence of their visit which you may not appreciate. So you may want to avoid such vines if you are not keen on cleaning up after the birds depart. 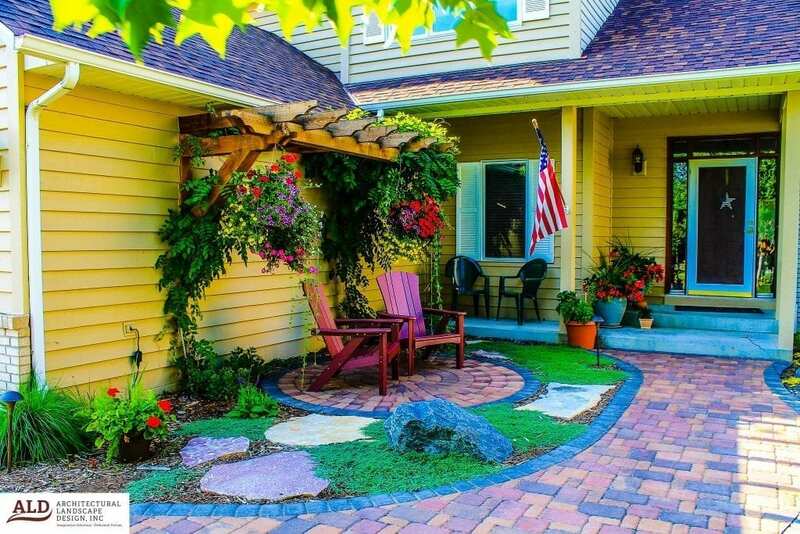 When you plant vines that bloom, they will attract colorful butterflies and hummingbirds that will leave you spellbound. Flowers also attract bees. While bees are an important part of the ecosystem and we need them for pollination, you may not want to have bees flying around your patio or pergola. So consider locating your trellis away from your garden seating area if the vines are going to get flowers. There are several types of vines and each one needs support. You can use a trellis to train them so that they don’t spread wildly across your garden. The kind of trellis you set up will depend on how the vines attach themselves to the trellis. Clinging Vines: These vines come with specialized growths to adhere to the support. These growths can be suctioned cups or claw that latches onto the trellis. Good examples of clinging vines are Boston Ivy and English Ivy. Twining Vines: These vines can twine around anything that comes their way, or they use tendrils to wrap around any support they find. Star jasmine uses its branches to wrap while grape vines use tendrils. Sprawling Vines: Sprawling vines tend to enjoy prolific growth and spread very easily. You need to tie them to the trellis if you want them to climb. An example of a sprawling vine is a climbing rose. You don’t have to buy expensive or ready-made trellis when you can make one at home. Use wooden stakes and connect them with string. You also can use wooden slats and nail them together to form a lattice. Some people create trellises by attaching chicken wire to two wooden posts. It is best to create a criss-cross pattern so that vines can grab and wrap themselves around the pattern. Trellis for flowering plants can be high, but if you are growing vegetables like cucumbers or fruits like melons, you may want to keep the trellis low so that you don’t need a step ladder to break the veggies or fruits. A height of about five feet should suffice in such cases. Choose a location that is downwind so that the wind does not push and break the frame or lattice on a usually windy day. Make sure you anchor the trellis well into the ground. It is after you install the trellis that you should plant the vines. Plant the seeds on the upwind side of your trellis and wait until the saplings are big enough to run. Then is the time to guide them gently onto the trellis. Once the vines or tendrils attach themselves to the trellis, you don’t have to train them anymore. Make sure you nip off the fuzzy tips at the top of the vines to prevent them from growing further than the height of the trellis. A trellis can transform your garden and make it look more organized and neat. It is a wonderful way to continue your love affair with greenery if space is a constraint. Just remember to water the vines often as they tend to transpire a lot since they come in contact with warm air and winds. You can use mulch the soil to minimize loss of moisture.